Put all the ingredients in your blender and blend away! Watermelon. It is 92% water and full with important electrolytes, vitamins, minerals, and antioxidants. The best thing it is naturally low-fat. One beneficial vitamin is Vitamin A which is great to keep skin and hair moisturized. This is because Vitamin A creates sebum for the hair, and it's important for the growth of new collagen and elastin cells. Watermelon is also great for the eyes. It helps produce pigments in the retina of the eye, prevents age-relate macular degeneration and also prevents night blindness. Other benefits include: soothes sore muscles, helps heart health, prevents cancer, and more. Spotted Bananas. Yellow bananas with spots has simple sugar and this makes it easier to digest. Bananas also have higher levels of antioxidants as they ripen and have anti-cancer qualities. They are naturally sweet, and can be so cheap to get. Bananas are full of carbohydrates and potassium. The fiber in the banana contains vitamin B6 which helps in the production of antibodies to fight off disease. Strawbs. Strawberries contain potassium, vitamin K and magnesium which are important for bone health. Strawberries are also filled with biotin, which helps build strong hair and nails. Vitamin C in strawberries is vital to the production of collagen, which helps improve the skin’s elasticity. Since we lose collagen as we age, eating foods rich in vitamin C result's in healthier, younger-looking skin. Vitamin C also plays an important role in strengthening the eye's cornea and retina. Hemp seeds. Hemp seeds are known for their abundance of omega 3 and omega 6 essential fatty acids making it a great alternative to fish. Hemp seeds also contain a high quantity of proteins.The omega fatty acids can improve your heart health and cholesterol levels. Dates. 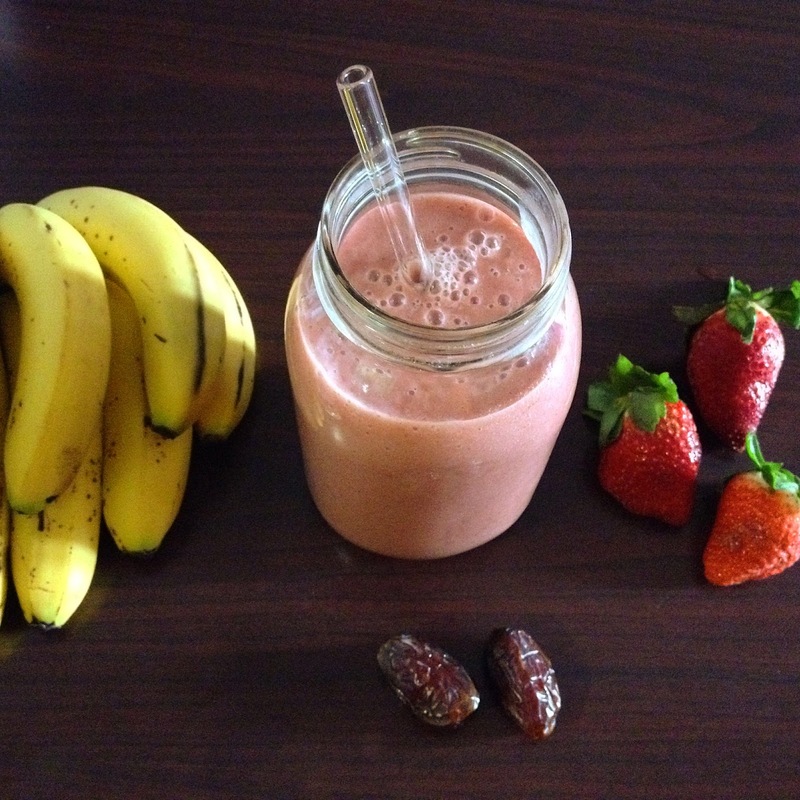 For natural sweetness in smoothies add dates. They are so sweet you won't need to add sugar if you add these. Dates contain the most glucose of any other fruit. Glucose is the body's primary source of energy that adding dates will ensure you have lasting energy. Just make sure they are pitted before dropping one into your blender. I hope you really get to try this recipe to see how good it is. It's so fruity and perfect for any time of the day. Until my next blog post!